Mother Nature won’t allow us to go out and play for at least a week. So what does Tom do? He turns this grounding into an excuse to have a party! He does the rounds, visiting every boat and advertising the Tehuantapec Potluck Party that will be held on the docks in a couple of days, making sure to include the dock workers as well. As usual, the party ends up on Camelot… Why am I not surprised??? Our very forgiving and pretty spacious boat welcomes the crew from eight other boats (22 people!) for a few good hours of fine dining and lively conversation. What a great time we had! The crowded cockpit - more people were on deck, too! As it turns out, we’re all pretty much going in the same direction, heading to Puerto Madero (the last port in Mexico) where we’ll all complete formalities to officially exit Mexico and replenish provisions before the passage to El Salvador. Over the next few days I’m secretly sulking. 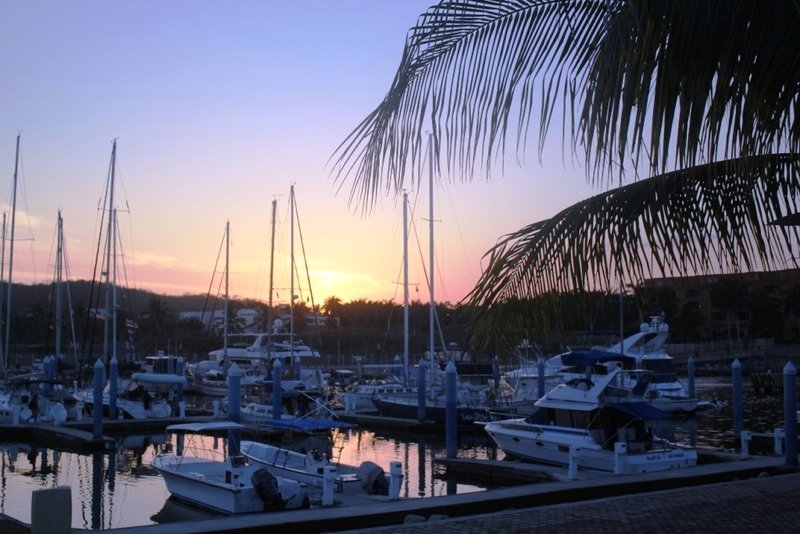 There are nine beautiful bays in Huatulco, with thirty-six spectacular beaches. There are wonderful little reefs that are begging to be explored, and I’m told the snorkeling here is legendary. My kayak is itching to go, and so am I. But did I get to see any of all that? Hell, NO! The weather got in my way… So let me sulk in peace. Tom instead is in his element; there’s a constant flurry of skippers from the other boats coming and going, all comparing notes on the next trip. 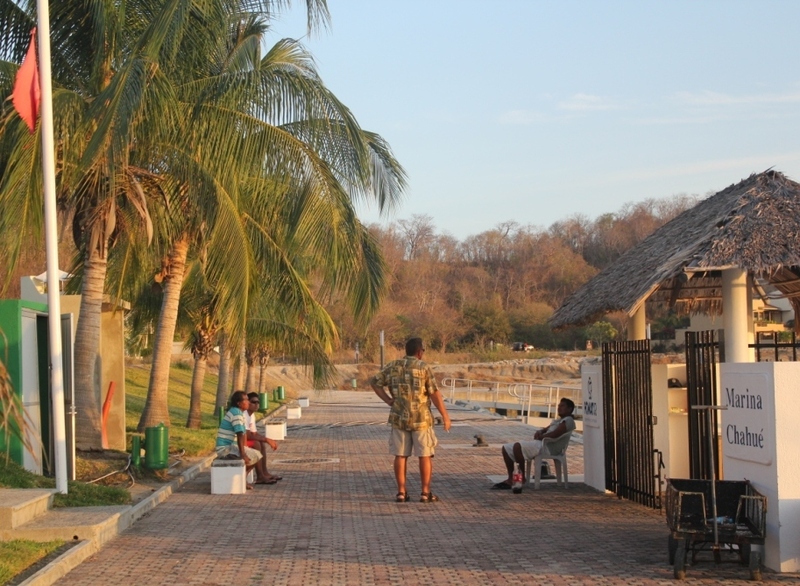 We all have to cross the threatening Tehuantapec Bay, a long and possibly hard crossing. 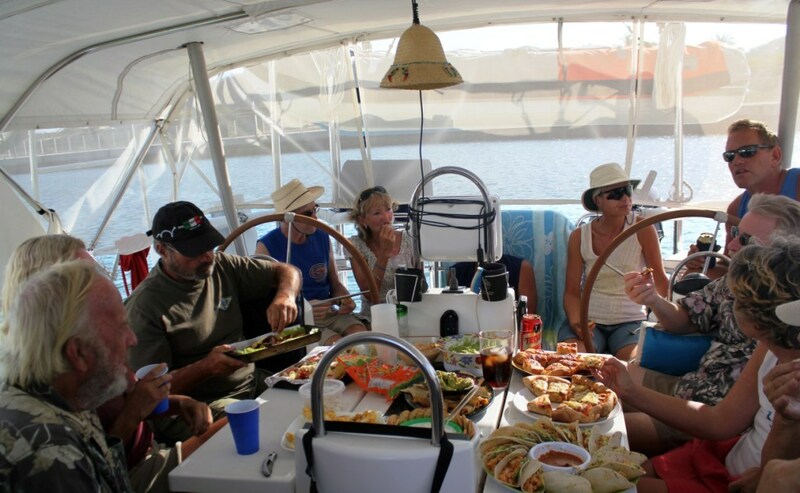 So everyone chips in: there’s collective studies on weather forecasts, speculations on positive or negative currents, exchanges of opinions on how far offshore is better to travel to avoid the wrath of the ocean, and a myriad other details. We even manage to take a couple of trips to the neighboring town of La Cruz, once for a nice dinner, and once for grocery shopping. Luckily, the wind storm finally abates long enough to allow us to plan our departure in relative safety. There’s another storm coming right on the tail of the first one, so we have to carefully plan our exit strategy to sneak between the two. The alternative is to be stuck here for at least another week, but we’re both determined to just go.